A Speech to the Clarendon Club, 1990. It is an old Collins School Atlas of Africa. Large areas of that continent were under the governancy of the British people, and they certainly fared no less well than they are faring now. In fact I would be so bold as to say that they were doing very much better under British rule in the 1940s and the 1950s than they are doing under the dictators whom we have been encouraged to allow to take command. I think we can say this: seldom has a nation abdicated responsibility, seldom has a nation committed suicide so rapidly as has the British nation since the end of the Second World War. We have gone astray. We have lost our sense of purpose, our sense of destiny, our sense of mission. We cannot really point to where it happened, unless we have a finely tuned sense of history. Then we begin to look at certain crossroads in the 1940s, perhaps even in the 1930s where Britain took the wrong turning. We have advanced so far now, after these wrong turnings, that we are forced to confront the question, is it a road that we can no longer retrace? Can the clock no longer be put back? Is Britain now doomed, or is there perhaps some way that a small band of dedicated men even at this late hour can turn the clock back to where it was when I was born, when Britain was a great nation? As an historian -- and a very independent minded historian of whom the newspapers in this country are frightened -- I can point to certain episodes in my lifetime when we took those wrong turnings, and in the course of the next hour I am going to look at the people who were responsible, and try and mark what we must watch out for in the future. Because the people who "did it before" could "do it again". I know that the newspapers in this country are particularly apprehensive about me, because when my Winston Churchill biography came out two years ago, they alone ganged up in a conspiracy of silence to ignore the book. This is not just the petulant outburst of an injured author who finds that his book is not being reviewed. I know this was a ganging-up, because I made inquiries. Every other book that I have written over thirty years had been prominently reviewed by the British press, usually in unison. The Churchill biography came out to a blanket of silence here, although in Australia it had been Number One top best seller within ten days -- right across the continent of Australia, from coast to coast. It met the same success in New Zealand, Canada, South Africa. So in London I took a step which for an author is most unusual: I wrote to every Literary Editor, and asked: Why? One of them replied: David Holloway, of the Daily Telegraph. He said: "Mr. Irving, we took a decision last November to ignore your book". Now, if you buy Martin Gilbert's opus on Churchill, you are confronted with two salient facts: the first is Gilbert's religion -- so you are not going to find out anything there about the forces which held sway over Winston Churchill from July 1936 onwards; and the second is that Gilbert was partly funded, as he himself frankly admits in the introduction, by foundations close to the Churchill family. I am not of course criticizing Mr. Gilbert for that. But how remarkable that not one single English reviewer has mentioned the latter fact. They have lauded the Gilbert version to the skies, without mentioning it. You can take it from me, ladies and gentlemen, that if I had put in the introduction to my Adolf Hitler biography "I am grateful for donations from the Adolf Hitler Memorial Trust" (Laughter), or if when I had published my Hermann Göring biography I had acknowledged financial assistance given to me "by the Carinhall Foundation" -- that was Hermann Göring's country estate -- then more than one English reviewer would have felt bound (Laughter) to give this fact at least a passing mention. Here too we are up against a kind of newspaper conspiracy of silence. There are certain things that educated, genteel English folk do not mention. What we do not mention are the connections between, uh, those people and these people. If you do, then you find yourselves being subjected to what Neil Ascherson in the Observer once called, reviewing a book by me, "buckets of slime". Peregrine Worsthorne, that great editor of the Sunday Telegraph, made so bold, a year or two ago now, as to draw attention to the fact that every single defendant in the Guinness Shares Scandal was of a certain, uh, type. (Laughter) I am not going to go into more detail than that. He mentioned in an editorial in the Sunday Telegraph that every single defendant was of a particular religion. This of course is entirely immaterial to us. We don't mind what religion people are. It makes no difference if Gerald Ronson and Ernest Saunders and the rest of them are not really called that at all; that "Tiny" Rowland's real name is something completely different is a matter of complete indifference to me. But what does worry me is that apart from the SundayTelegraph the English press for some reason found it necessary not to mention this -- that this was an obvious unifying factor which for some reason or other had not to be mentioned. Self-censorship and my lack of this kind of self-censorship, over thirty years of writing books, is what has got me into trouble: my refusal to kowtow, my refusal to be apprehensive about mentioning these things. I can give you one very vivid example from my own literary career. I wrote a history of the Hungarian uprising of 1956. In 1981 it was published by Hodder & Stoughton, Ltd (my publishers in this country are all of the finest pedigree). In my research for that book, I went behind the Iron Curtain seven or eight times and researched in the Hungarian archives and the Party archives; in Moscow I interviewed the Russian general [Pavel Batov] who had commanded the tanks that crushed the uprising; in the United States I researched in files of the Central Intelligence Agency and the American President Dwight D. Eisenhower, and I got to the bottom of what really happened. I very rapidly found out, as I read the C.I.A. refugee-profiles, that there was one unifying factor in the Budapest Government against which the entire Hungarian people rose in their outrage, which was not mentioned anywhere else. This was that every single member of the hated Hungarian Communist government -- Ernö Gerö, Joseph Reval, Miklos Farkas, all these "funkies", the funcionariosok in Budapest, were all of the same religion; the Hungarian Uprising began in fact as a typical old-fashioned pogrom. Nobody mentioned it in print at the time, and (almost) nobody else has mentioned it subsequently, although this was the most important feature of the Uprising of 1956. Only one person in authority, to my knowledge, has ever drawn attention to this unhappy unifying feature: that the torturers, the murderers, and the police ministers of all these countries where the Bolsheviks had taken power, whether briefly or permanently, were all linked by that one characteristic feature. And that person was Winston Churchill! Churchill wrote an article which was so viciously antisemitic that I would certainly hesitate to put my name to it. It went overboard in drawing attention to the torture, the terror, the murderous methods used by these people. I contacted the established expert on Churchill's literary career, the bibliographers as they are called, at the University of Oregon in Eugene, and asked if there was any evidence that this article was written by Churchill, or could it have been faked by somebody else? Back came the answer, We regret to have to say that it was indeed written by Churchill: we cannot understand what got into him. Well, what got into Churchill in 1920 got out of him in July 1936. (Laughter). At a dinner in North London rather smaller than this evening's, on July 22, 1936, it was put to Winston Churchill by various influential businessmen -- again I am not going to go into detail about who they were -- that they might finance him. One of those present was the Vice Chairman of the Board of Deputies, Sir Robert Waley Cohen. His biography was published in an authorized version by Robert Henriques; he quite openly boasted that at this dinner they put up £50,000 pounds to finance a secret group to keep Churchill afloat, provided he turned his magnificent oratory, his brilliant writing talents away from his targets at the time, which were India and Defence, and direct his cannon squarely upon their enemy, Nazi Germany. Imagine that in terms of 1990 currency! The secret pressure group was called The Focus. I was deeply shocked when I found all this out, because at that point -- I was in my thirties -- I was so blue-eyed and innocent that I did not believe that British politicians took slush money from anyone, and certainly not when it was against the interests of their own country. Later on, as I continued to research my Churchill biography, I found that they were all at it. Labour, Liberal, Conservative, Unionist -- they were all taking money, and it wasn't only from the Pay Office at the House of Commons. Churchill wasn't in the Cabinet in the 1930s, he was in the wilderness. So how could he afford his huge staff at, Chartwell, his country house? (Indeed, how could he afford the country house!) He had a staff of gardeners, nurses, nannies, secretaries, ghost-writers and chauffeurs; and all of these people were apparently being paid out of his salary as a Member of Parliament, five hundred pounds per annum. The answer is, he was taking money from other places, and not one newspaper commented on this fact. His entire group, The Focus, which included such names as Harold Macmillan, my own illustrious publisher, and a large number of other Conservative Members of Parliament and Labour Members of Parliament, influential former ministers and businessmen -- they were directly or indirectly in the pay of people like those North London businessmen or foreign governments. After the Munich Agreement of September 29, 1938, when Mr. Neville Chamberlain -- who was not in the pay of anyone, so far as I know -- went over to see Adolf Hitler and to sign, with Benito Mussolini and Edouard Daladier, the agreement which effectively spelt the end of Czechoslovakia as a military force in Europe, the Czech Government realized that their time had run out. One of the Conservative MPs in The Focus, General Sir Edward Spears, had a wife, an American novelist called Mary Borden. I found her private diary in Boston University, in Massachusetts. And there it was: October 3 1938 -- four days after the Munich Agreement was signed -- there was Lady Spears writing, totally unabashed, "Poor Edward. Now there's bound to be a General Election". "Faced with the prospect of losing £2,000 a year from the Czechs". Can you believe it! "And his seat in Parliament". It is there in black and white in the diary of this lady, the wife of the Conservative Member of Parliament for Carlisle. In the files I found a telephone call which the Czech Ambassador Mr. Jan Masaryk made in September 1938 to Prague saying, Mr. Churchill is asking for more! Mr. Attlee is asking for more as well! The Czech files show that two million pounds had already been sent from Prague to London in July 1938 for the bribing of "influential opposition Conservative MPs". With a Conservative Government in office, "opposition Conservatives" means the groups around Mr. Churchill, Macmillan, Anthony Eden. These and the rest of them took two million pounds in July 1938, to sell their own country, Britain, the Britain I was born into, down the River Moldau. It is the job of the historians to find out the really "guilty men". Mr. Michael Foot, a writer whom I deeply admire although a Socialist, wrote a book in 1938 called The Guilty Men. He did not know the half of it! He was pointing his finger at the innocent ones, like Neville Chamberlain, who had tried to save the peace. One thing was quite plain: this marked one of the fateful wrong turnings that we took. As soon as Britain went to war, we began to lose our empire. Of course afterwards, in the 1950s and 1960s, you heard it said again and again: the empire was going anyway! That is a criminal fatalism. If we had enough strength and manhood -- and I know there are many old soldiers amongst you this evening, ladies and gentlemen; if we had enough strength and manhood to fight a desperate war for six years against a ruthless, determined, brave enemy, then we certainly had the strength to keep an empire together. How can anyone now say that we could not keep a farflung empire, today in the 1980s and 1990s, when we have satellite communications, supersonic transport planes and all the other methods of shrinking global distances? It is only the weary old defeatists who have said otherwise -- the guilty ones of the 1930s and the 1940s, who found to their mystification that bit by bit we were losing everything and we didn't really understand why. In all the immense literature about the 1939-1945 war, one may observe a legend in process of being shaped. Gradually, authentic memories of the war -- of its boredom, its futility, the sense it gave of being part of a process of decomposition -- fade in favor of the legendary version, embodied in Churchill's rhetoric and all the other narratives by field marshals, air marshals and admirals, creating the same impression of a titanic and forever memorable struggle in defense of civilization. In fact, of course, the war's ostensible aims -- the defense of a defunct Empire, a spent Revolution, and bogus Freedoms -- were meaningless in the context of the times. They will probably rate in the end no more than a footnote on the last page of the last chapter of the story of our civilization. Malcolm Muggeridge, Esquire, February 1968. Why in God's name did we get into war in 1939? Because we gave a guarantee in March 1939 to the Poles. We have the records now. Neville Chamberlain was tricked into giving the guarantee by people like Ian Colvin of the News Chronicle, a newspaper heavily financed by the kind of people I have talking about earlier. And here's Ian Colvin, their young Berlin correspondent, getting an audience of the prime minister in March 1939 land telling Mr. Chamberlain, on the instructions of The Focus, that Hitler has given orders to invade Poland almost immediately. Chamberlain is panicked into issuing that fateful guarantee -- the guarantee of March 31, 1939, that if Poland was attacked, then Britain would stand by her side. That was the hidden moment which first saw the British Empire beginning to fall apart. And it was all done by these mysterious forces behind the scenes, who for ruthless reasons of their own wanted war in Central Europe. What should we have done, if we had had politicians who were statesmen for Britain, through and through, and who knew only the red-white-and-blue flag of our forefathers, and who weren't in foreign pay? We should have said to the Poles: so, you've got a squabble with Herr Hitler? You've got a squabble with Germany? -- sort it out yourselves! Our empire is more important to us. (Applause). And if we had had trueblooded English statesmen at that time, then they should have said to the immigrants and refugees who flooded towards our shores, and whom we quite naturally took on board, as we shall always take on board people who are desperately, sincerely, fearful for their lives, they should have said to them: You are guests. So long as you are our guests here, then you do as we English decree! But we are not going to be led astray by you. We should have said to these people: so, you have a squabble with the Nazi Party? -- sort it out yourselves! Because it was a squabble: these people had started an international boycott of Germany as soon as the Nazis came to power; for four, five or six years before that they had been fighting a war, from inside the police stations and in side the newspapers in Berlin and Hamburg and Munich against the rise of National Socialism in Germany. Any historian can tell you this. It was a fight between these two forces in Germany. And it was fought with the cudgel and the cosh and the pistol and the dagger in the darkness. And what had it got to do with Britain or the British Empire? Nothing whatsoever. (Applause). But there we were, encouraged to interfere, because these people who came flooding toward our shores found that their friends were already here in the media. And the situation has become progressively worse over the decades since then. You only have to look at the concentration of British media power in the hands of a foreign-born executive like Mr. Robert Maxwell to realize the danger that the British people, as a proud entity, is now in. If we watch television very late at night, around 11.30 or 12 p.m., we get the old movies -- the Ealing comedies and Edgar Lustgarten movies that were made in Britain in 1940 or 1950. You can't quite put your finger on it: but there's something ... it's how Britain used to be; it is how Britain used to be before the foreigners came flooding in. Those were the days, of course, the 1940s and the 1950s, when you could go for a walk down Oxford Street at night without fear of being mugged, or worse; those were the days when around the entire world you could ask any school child, what do you know about the British policeman? And back came the answer: "He is unarmed!" We were proud of that. We were proud of our traditions. Britain was a haven of thriving industries, of intelligent and forthright people whose word could be trusted. But now it isn't. Britain has become a nation where some people's rights have to be specially protected by law, instead of by one's own natural Christian instincts; a nation where the newest newcomer is given preference over the people who have been here, with family and forefathers and ancestors, for centuries. Everything has been stood on its head. And we are baffled and perplexed and confused by it all, because wherever we turn, we English and Scots and Welsh and Irish, -- wherever we look we cannot find any political party or any force or any faction that is prepared to stand up for us. Where are the Englishmen in office? Mrs. Thatcher? We know whose pocket Mrs. Thatcher is in. She's in the pocket of her constituents (Laughter and applause). Well, Britain is a "democracy" and it is right that the prime minister should be in the pocket of her constituents, if these constituents are a representative cross-section of the English people. I should be interested to know how many of those constituents had their parents or their grandparents in Britain in the 1930s and the 1940s. Take Mr. Martin Gilbert, my great rival as a historian. He was not even in Britain during the war: from the wealthy and the influential family that he came, he was immediately shuffled overseas to Canada, so that no harm should come to him. Perhaps he could not dispose otherwise. Meanwhile we English sat here and sweated out what the other people had inflicted on our country. We tried to pick up the pieces in 1945. We still don't really know what happened. The important historical records are still closed, even though ostensibly we should see all records that are thirty years old. You go down the road to Kew and have a look at the archives there and you will find that you are not shown what you want to see. Take the summer of 1940, when Britain came to its other fateful crossroads, after France, Poland, the Low Countries, Norway and Denmark were all in German hands: at this point in Britain's tragic history, our "deadly foe" Adolf Hitler came to us with an offer so generous that you can only scratch your head now and ask, Well, what went wrong? I've seen it in the German, the Swedish, the Swiss and the American archives; but there are only vague traces of it in the British archives, because it has all been blanketed out -- pasted over, like certain paragraphs in the Cabinet minutes of May, June, and July 1940, which you are not allowed to read even now, fifty years later. The peace offer was this: Hitler declared that he was prepared to pull his armies out of France, Holland, Belgium, Norway, Denmark, Poland and Czechoslovakia -- out of all these territories except of course for the regions which had been German before and which he had fought the war over. Now that he had the territories like Alsace and Lorraine back, he was not going to let them go. So he decided to fight on. He made those magnificent speeches in the House, and he had them broadcast by the BBC -- not by himself, because he was not fit to broadcast in the evenings, so Norman Shelley of the BBC did it. (Those of you who are my age will remember him from Children's Hour -- I always thought he was Larry the Lamb, but apparently he was the Mayor of Toytown.) Norman Shelley himself told me this, and I checked it out in the BBC's files; sure enough, every other Churchill broadcast is there -- he did not get paid, but the contract is there -- except for these key speeches that summer. You remember: "... If the British Empire and its Commonwealth lasts for a thousand years men will still say, This was their finest hour". He didn't broadcast that speech. It was broadcast by Larry the Lamb. (Loud laughter). Churchill had to make the British people think they were in danger of invasion. He knew they weren't, because he was reading the German codes: in May 1940 we had broken the German airforce operational code, and he knew that Britain was in no danger of invasion whatsoever. He knew from reading the German High Command's most secret messages -- he alone: not his Cabinet, and not his General Staff -- he knew that Hitler was planning to invade Russia. That's how Churchill made the bold move sending Britain's only armoured division out to the Middle East that summer. The Chief of the Imperial Staff said, "Prime Minister, isn't this a serious risk to the British Isles, when we may be facing invasion -- as you say -- at any moment?" Churchill said, "That's a risk that I think, on balance we can take!" Winston Churchill, in his own memoirs, marks Stanley Baldwin in the index with the entry: "Puts Party before Country". But Mr. Churchill put himself before his Party, and his Party before the country. He was determined to stay in office, by hook or by crook, and to that end, we now know from the British Air Ministry files, he deliberately provoked the bombing of London. The war had to be prolonged. Over the next few weeks there are going to be anniversaries until they're coming out of your ears and eyeballs -- the Battle of Britain, the Few, the Fourteenth of September -- there is going to be speech after speech, and broadcast after broadcast, and I guarantee that not one of them is going to tell you what you can find in my Churchill biography, that Churchill himself deliberately provoked the attack on London, because he needed it to kill off the peace movement in Britain. Enough people knew about the German peace offer in the summer of 1940 to want to accept it. In his own Cabinet, Lord Beaverbrook, the minister of aircraft production; Lord Halifax, the foreign secretary; Neville Chamberlain, the former prime minister -- all wanted peace! The only way out of this dilemma that he saw was to provoke That Man to bomb our London. So Churchill started bombing Berlin, which until that time had not been bombed. Churchill knew from codebreaking that Hitler had ordered that under no circumstances was London to be bombed. Hitler had actually banned the bombing of any British towns as such; the Luftwaffe was bombing Portsmouth dockyards and places like Liverpool for the docks, but they were not bombing towns; and London was totally embargoed. We've got these records and orders from the German side. Churchill knew it from codebreaking. He had to smash his way through Hitler's own magnanimity somehow. One afternoon, it was August 3, a Sunday afternoon -- General Charles de Gaulle visited Churchill at Chequers and he found that little portly prime minister, Britain's Nemesis, standing in the middle of the lawn at Chequers, shaking his fist at the sky, saying: "Why won't you come!" (Laughter). Because -- Hitler wasn't attacking London. So at the end of August Churchill bombed Berlin -- not just once but seven times. The telephone conversations between Churchill and RAF Bomber Command headquarters are in the archives now: you can see where Churchill makes the decision. Sir Charles Portal, at that time the commander-in-chief of Bomber Command, said, But Prime Minister, I draw your attention to the fact that this may result in the Germans lifting their embargo and bombing London. 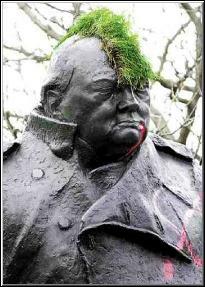 Churchill just twinkled. After the sixth or seventh British raid, Hitler made his famous speech in Berlin -- September 4, 1940 -- in which he said that if the British came and bombed Berlin once more then he would "eradicate" British cities. Churchill phoned Bomber Command once again: "Bomb Berlin". The day after that, the Blitz begins. On September 7, a thousand German bombers in broad daylight come down the Thames, bombing the East End of London. Three hundred and sixty Londoners die. Mr. Churchill himself, forewarned by the codebreakers, has fled to Oxfordshire. Over the next month, September 1940, seven thousand are killed, including 700 children. It is the end of Britain's hopes for peace. That was a fateful turning point for the British Empire not in the way you might think, not in the sense of being "saved by Britain fighting alone", but in the sense of being doomed. Because the war continued, thereby prolonging Winston Churchill's period in office. By early December 1940 Britain was already bankrupt. No more dollars; President Roosevelt sent an American battleship to Simonstown to pick up our last gold reserves in South Africa, £50,000,000. From that point on we were totally in the pocket of the Americans. Let us not forget, Winston Churchill was half-American. "The greatest living Englishman" is a lie: he put the United States of America before the Empire whenever there was an alternative in front of him. He did not consult with Mackenzie King in Canada. He did not consult with the New Zealand Prime Minister Fraser, he did not consult with the Viceroy of India about what he was doing: he travelled across the Atlantic in August of 1941 and consulted with President Roosevelt! Off Newfoundland, on the very threshold of Canada, and he did not even tell the Canadian prime minister he was there. Mackenzie King found out purely by chance that Churchill was there, consulting with a neutral president. And we still don't know precisely what intermediaries had passed between Roosevelt and Churchill in the years before 1939. We know that on one occasion Felix Frankfurter, the first U.S. Supreme Court justice of his race, was sent over to London by Roosevelt to consult with Churchill. At that time Churchill was still drawing money from those authorities in London, who were in turn being financed by similar bodies in the United States, Clark Eichelberger & Co. Even if we all pull together, jointly and severally for the next ten, twenty or thirty years, and manage to put the clock back, say, half an hour of its time, the really Guilty People will have passed on, commemorated only by the bronze plaques and the statues and the memorials scattered around our capital. We can go around and efface those monuments; but it is going to be a damned sight harder to put Britain back where it was. I don't think Mrs. Thatcher or her like are going to be the people to do it. Even less do I think the Socialist Party are going to be the people to do it. Nothing makes me shudder more than two or three months, working on a new manuscript, and I arrive back at Heathrow Airport -- where of course, my passport is checked by a Pakistani immigration officer (Laughter). Isn't that a humiliation for us English? (Applause) -- and I go outside the Terminal building and there is the Evening Standard placard saying, "Kinnock in Fresh Wedgwood Benn Row". This I think is about the lowest point in one's human emotions: "Kinnock in Fresh Wedgwood Benn Row". Britain's destiny, in the hands of people whose minds are so small that they could pass effortlessly through the eye of a needle. (Applause). These are politicians who are incapable of thinking beyond their next constituency surgery. They are incapable of thinking beyond the petty issues of the day. They can't see that the kingdom over which they hope to ordain in future years is shrinking, and becoming more and more polluted; that the peoples for whose interests they have to care are becoming more and more unlike the English, the more they look at them. They are incapable of thinking in terms of centuries. Now, Adolf Hitler was a man with whom I am very familiar, having spent twenty years of my life studying him, talking to advisers, his staff and so on, who told me all about him, warts and all: and Hitler said one thing about Joseph Stalin which has stuck in my mind. "Stalin", he said in the autumn of 1941, when he was pretty convinced that he had defeated that man, "Stalin, whatever you may think about him, he's a man who thinks in terms of centuries". And this was Hitler's own downfall: because Stalin, thinking in centuries, had pulled his armies back and had allowed the Germans to wade into the great vastness of the Soviet Union, regardless of Russian casualties. You cannot, ladies and gentlemen, looking at our present "statesmen" in the House of Commons, or in the House of Lords, say: These are men who think in terms of centuries. They are apprehensive, they are in the pocket of somebody else (who is usually in the pocket of yet another person); before they take any decision they telephone the White House in Washington, or who knows where else. They read strange newspapers. They sometimes adhere to strange religions. They foster remarkable beliefs. They are un-English politicians. They do not deserve this predicate of "Englishmen" or "Englishwomen". Now those of us who are historians, who have devoted our entire thinking careers of thirty or forty years to the study of the development of historical events -- we can say what is going to happen, just like that! You have a sound gut-instinct which tells you, if this has been happening over the last few months then that is bound to happen next week, and probably that in two years time and that means that five years from now the following is going to happen. Take last year, October 3, 1989. I had to go to Berlin. I had been invited to Berlin to appear on a German television programme; it was to be attended by five or six German "historians". A week later, I got a phone call from Sender Freies Berlin: "Mr. Irving, it's rather embarrassing, we're going to have to ask you not to come, because all the other historians have refused to sit at the same table as you!" "Well, it's rather embarrassing for you, actually, because I've bought my air ticket and I've reserved the same hotel already. So I shall be there!" (Laughter). "Mr. Irving, I am afraid you misunderstand. You are not invited to the programme any longer!" "Oh no, I won't be in your studio, I'll be outside it, with my friends". And so on October 3 last year, 1989, we paraded up and down outside the Sender Freies Berlin television station in Masuren Allee in Berlin, with placards in English (and German, so that even the thickest German could understand it): "German Historians -- Liars and Cowards". I only mention this incident, because that morning I held a press conference in the Hotel Kempinski in Berlin. All the Berlin press came, and the National press, the Deutsche Presse Agentur and the radio stations. And in that press conference I said: "You won't believe this. But within twelve months Germany will be reunited!" There were embarrassed titters from the German journalists. It was a ridiculous idea. That a country that had been split for over forty years could suddenly be reunited. The Wall still stood. It was too absurd, and here was an Englishman saying it. On November 9 the Wall came down. It was so obvious: you could see it happening there was no way that East Germany could continue to survive, and yet they themselves could not see it. It couldn't survive because Poland had gone democratic, and all the eight railway and road links between the Soviet Union and East Germany go across Poland. So East Germany was "lost" to Moscow. It was bound to happen sooner or later, and I said: "Within twelve months". At a Madrid television programme on December 16, 1989, I shortened the estimate: I said, "I think reunification is going to come in six months". All the German journalists who took part in this programme, "A traves del espejo", fell about laughing. The local man from the Frankfurter Allgemeine Zeitung burst out, "This is totally ridiculous. How can this Englishman say such lunacy!" Because even in December, nobody was talking about German reunification. And now it is happening. I can go further, and I shall say what is going to happen in the next ten years. The Deutsche Presse Agentur, the German press agency, last week published a profile in the German newspapers in which they repeat my bold predictions: you are going to get back the eastern German territories: you are going to get them back by horse-trading with the Poles. The Poles can't repay their debts to you. You'll just do a straightforward commercial transaction. Mrs. Thatcher doesn't seem to have spotted that it's going to happen. Perhaps she ought to read these German newspapers then she can hear what I am saying: Within the next ten or twenty years, Germany is going to establish an economic hegemony in Eastern Europe and beyond, into the deepest marchlands of the Soviet Union; they are going to achieve by the power of the Deutschmark everything that Hitler set out to achieve in June 1941 with the tank. And this means inevitably the collapse of the Common Market on which we have pinned all our hopes. Britain is going to be out in the cold, because Mrs. Thatcher is doing everything she can to offend the Germans. And why? This brings me back to where I came in, at the beginning of this speech: because she is in the pocket of people who want her to offend the Germans. We cannot carry on like that, ladies and gentlemen. We cannot keep taking the wrong turnings. We have got to realize that once again Britain is at a turning point, and that if we want to set about restoring what we have lost in the last fifty years through feckless government, through the follies of our feeble politicians, then we are going to have to back a winner in future; and we are going to have to restore our own strength from a solid firm base. And that solid, firm base is going to be a democratic Germany. Then we can start clearing up our own homeland again, and getting rid of the corrupt politicians. There's probably not one politician today who is not taking some kind of backhander from some slush fund, or some foreign country, or some big business, or some industrial interest in the United Kingdom. Look at the way they die: rich -- rich beyond the dreams of avarice! Cap in hand, they can barely afford to fight their election battles, but when they die -- it's all spelled out there in the Wills & Testaments in The Times! Where's all that money come from? It hasn't come from their pay as Members of Parliament. It's come from the cash handouts, from the interests they represent. Not one of those has Britain itself at heart. Those interests are purely petty, insular, self-centred, and not infrequently anti-English at heart. How else do you understand that this country has been flooded by immigrants in the last forty years? Not because we needed them. Big business needed them. Big business did not give a hoot about British traditions, and British style, and British culture, and British civilization. Their shipping lines, their airlines, profited from this influx. It did not matter if the immigrants were totally alien to the culture of this country. The Immigration Problem in this country is a tragedy inflicted on both our peoples, both ours and the peoples of the immigrants. It has got to be resolved in some benevolent way. It can no longer be solved one hundred percent, because the problem has been allowed to fester for too long since it was inflicted on us in the fifties. But we can begin to turn the clock back there, if our politicians have the will -- if they still have the desire to restore something of the old country of which we in this room are all proud. The French are doing it, oddly enough: and France is a Socialist country! They are offering every North African immigrant £30,000 to go. There's a bit of Socialist pragmatism for you. But they know their immigrants: "We're not going to give it to you all at once. We're going to give you so much for each year that you stay out of our country". We have to do the same in this country. This is how I understand the concept of Benevolent Repatriation. You are going to have to say to the West Indians because those are the ones we find the most alien to our own culture: You must be out of your mind! Look at the countries you left. We understand why you left, because you were lured here by Twentieth Century slave traders, to do work that the English did not want to do. I have spoken to scores of them, people in the east end of London; they want to return to Saint Lucia or Barbados or Jamaica where they came from, but they can't get back. Let us say to them, We shall organize it for you in the same way that these ruthless people organized your coming in the first place. We shall organize it for you -- in a benevolent way. You will be welcome to come back as tourists in future, the same as we can visit Barbados or Saint Lucia or Jamaica as tourists. Ladies and gentlemen, you visit one of those countries, and the first thing that the Immigration Officers want to see is your two-way ticket; because they are not going to let you stay. On the same basis these people can come back to England as often as they like, provided that their Residence is back where they came from. We shall provide them with a container to ship their furniture, their colour television, their English motor car -- because that will provide years of work for motor mechanics over there! -- they can take it all back with them and everybody will be happy. It only needs the right kind of propaganda drive behind it. You are still not going to clean one hundred percent of them out of this country; that would be illusory, that would be Utopian even to think of it. But you can take the pressure off both our unhappy peoples. I am not going to say there are going to be "rivers of blood" otherwise, there won't be. But there are going to be acres of unhappiness, between the Old British, who have been here perhaps since the turn of the century, and the New British, who are really quite aware that they are not welcome while they are here. It only needs somebody with the will. It needs a statesman. It needs a coming together of people who think like English folk. There are precious few of them in the House of Commons at present. Our politicians do not have the interests of Britain at heart. (Hear hear). I have no interest myself in going into politics, ladies and gentlemen, because politics in Britain stink. But I am trying to open people's eyes. Up and down the country I am going to be holding little meetings like this, little gatherings, little dinners for people. The next ones are going to be in Manchester and Edinburgh in the next month or two. We are going to have to find the people who think like Englishmen, and who have their own nation's interests at heart. You have to have faith: there is an English faith which is born from the English tradition -- the tradition which began not in 1900 or in 1800, but which goes back for two thousand years through all the sorrows and travails of this great country which we are so proud to call our own. But it is a country which has to be nurtured and cultivated and tended preciously against alien interests who do not have this country's destiny at heart. Ladies and gentlemen, all that it takes is an act of commitment; and a sense of faith. I believe that there are enough people in Britain who have that sense of faith. David Irving's books can be purchased from his Focal Point Press site. The photographs and the descriptions that accompany them have been added to Irving's text, as has the Muggeridge quotation.